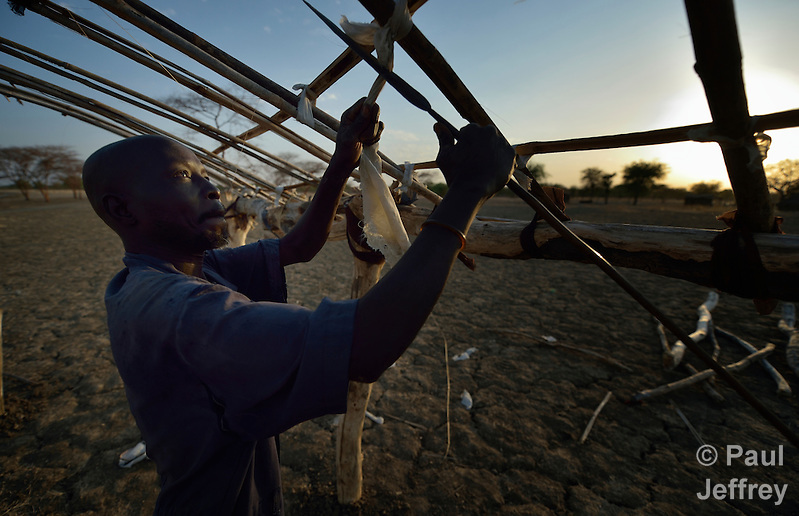 Global Lens » Archive » South Sudan – Is there hope? 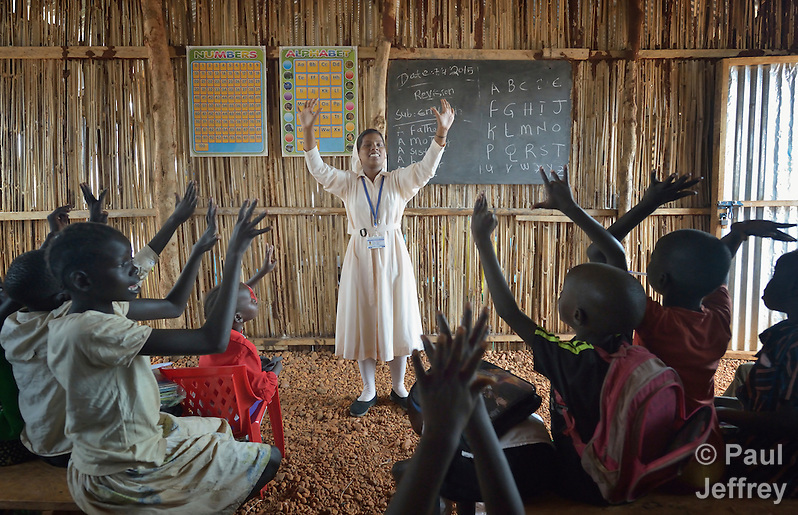 South Sudan – Is there hope? Cecil the Lion is dead. In an act that has been rightly criticized all over the world, a Minnesota dentist traveled to Zimbabwe and paid a lot of money to wound the iconic lion and then chase him for two days before finally killing the animal and skinning him to take home a “trophy” to his perverted sense of manhood. The resulting scandal illustrates well how the fate of charismatic megafauna gets inordinate attention in both traditional and social media, while the steady extinction of lesser-loved species of insects and amphibians, for example, elicits hardly a tear from most of us. The contrast is just as stark if we compare the attention Cecil’s killing received with the world’s reaction to the violence in South Sudan. Since a political dispute ripped the country along tribal and ethnic lines in December 2013, South Sudan has plunged into hell. If the same level of violence had occurred in many other parts of the world, it would be front page news. Alas, it’s just one more story of senseless death in Africa, so it gets filed under “nothing we can do about it.” Better to celebrate the return of Bloom County. I covered life in South Sudan in 2014, accompanying ordnance disposal teams and photographing people who had fled the fighting as they came out of the bush after weeks of eating only leaves, sleeping in the open as they waited for help from aid agencies–aid which sometimes materialized and sometimes didn’t. I returned in 2015 to find a country from which three-quarters of a million people have fled as refugees to neighboring countries, while some 1.6 million are displaced from their homes inside the country. Most of them are farmers, and the fighting has kept them from growing food to feed themselves. The result is mass starvation, about which aid agencies have been warning for more than a year. Yet dying people in South Sudan aren’t as charismatic as lions, so much of the media has occupied themselves with chasing other stories, from the ebola outbreak to Donald Trump’s hair, rather than wrestle with the complicated and heartbreaking violence in South Sudan. Wasn’t that the country that became independent in 2011? We like happy endings, so we’re reluctant to reopen the story. Fortunately, not all have turned away. Nicholas Kristof of the New York Times has done an excellent job over the years of covering Sudan and South Sudan, and is now taking videographers with him. 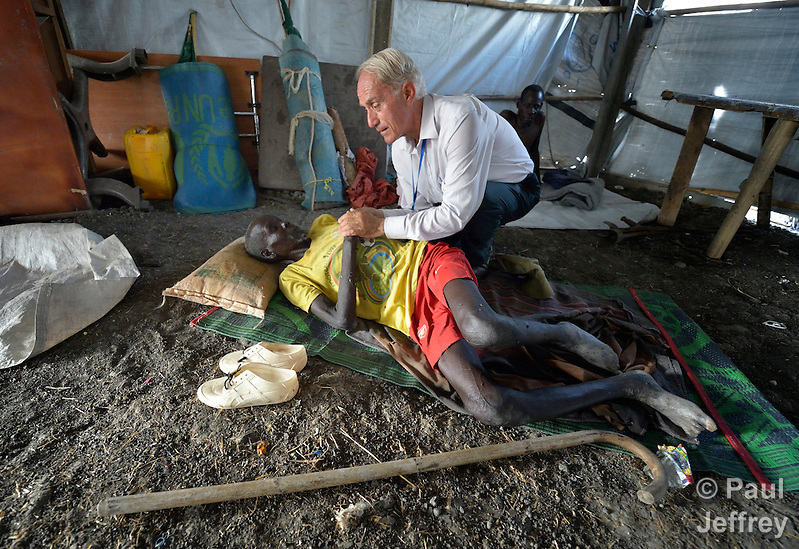 He recently filed this moving video report about starvation in South Sudan. And he hasn’t forgotten those in neighboring Sudan who continue to live under daily bombardment from the war criminals in Khartoum. The conflict in South Sudan did get some attention as President Barack Obama visited the region in July, with advice and counsel and prescriptions for peace from several sources, but when his plane took off from Addis Ababa the press started gazing elsewhere. 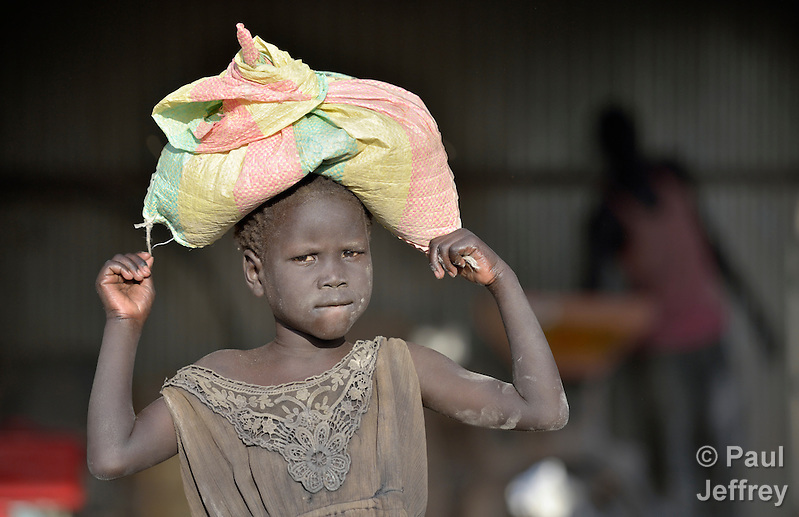 Just as the bad news about South Sudan isn’t being widely told, neither is the good news. During five weeks I spent there earlier this year, I tried to maintain some balance, recognizing that amidst the death there are many working for life. I particularly worked on finding stories of how the church continues to accompany the people of South Sudan. That in itself is a complicated story with a long history, and it’s often a story of risk and sacrifice where the church finds an opportunity to do what it does best: stand beside people who are oppressed and accompany them as they work for justice and peace. 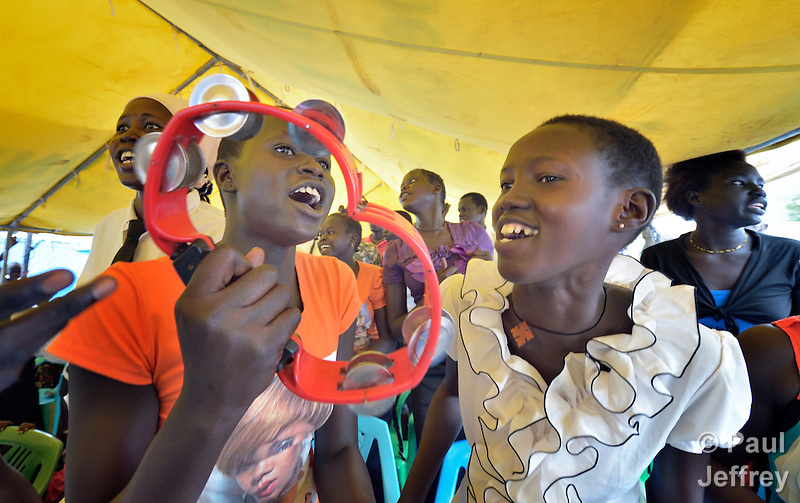 Not to mention breaking out the drums and tambourines when it’s time to celebrate Easter, as here inside a United Nations base in Juba where thousands of Nuer have fled for protection. 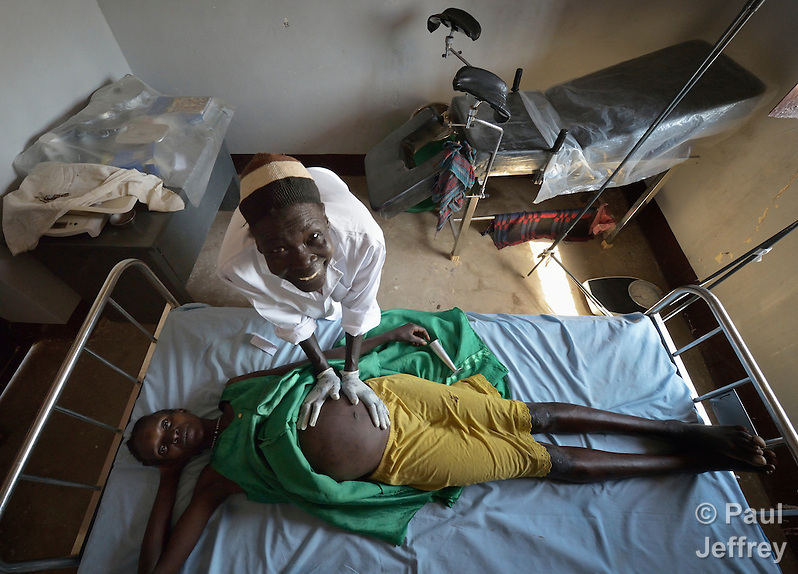 Some of this year’s images that stand out for me include those of women like Nyanthak Arop Mahadi, the midwife seen here examining Nyankiir Makuac Deng in a church-sponsored clinic in Mading Achueng, a village in Abyei, a contested region along the border between Sudan and South Sudan. Under a 2005 peace agreement, the region was supposed to have a referendum to decide which country it would join, but the two countries have yet to agree on who can vote. In 2011, militias aligned with Khartoum drove out most of the Dinka Ngok residents, pushing them across a river into the town of Agok. 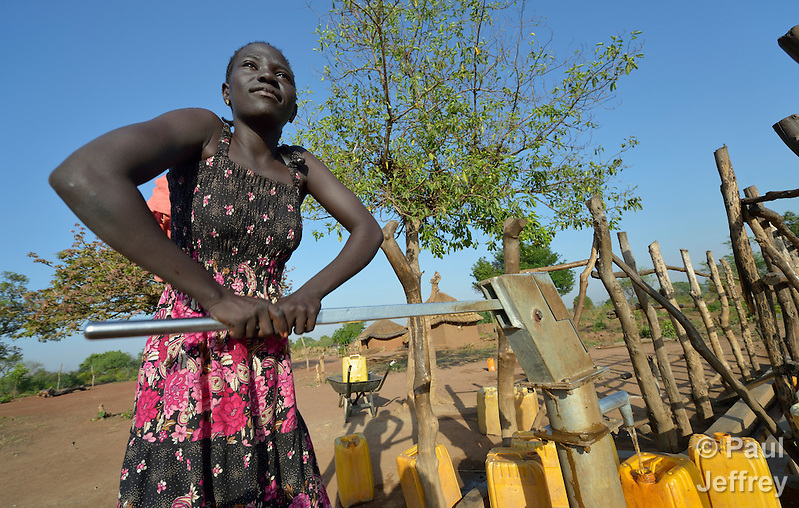 Yet more than 40,000 Dinka Ngok have since returned–despite renewed attacks by the north–with support from the Catholic Church, which has drilled wells, built houses, opened clinics and provided seeds and tools for the returnees. Nyanthak struck me as emblematic of that sense of accompaniment in a very dangerous context, literally bringing life into being. Mike Bassano impressed me in a similar fashion. He’s a Maryknoll priest from the United States who is living inside the U.N. base in Malakal among thousands of civilians who fled there for their safety as the city became a free-fire zone. Here’s an article I wrote about Mike and his work, which includes a compelling story about his discovery of the suffering Christ on Good Friday. I also documented how people of faith are helping feed the hungry. That happens two ways. There’s the organized response of church aid agencies, but just as important is the solidarity of ordinary people as they welcome the displaced into their communities, no matter that the newcomers may speak a different language or belong to a different tribe. 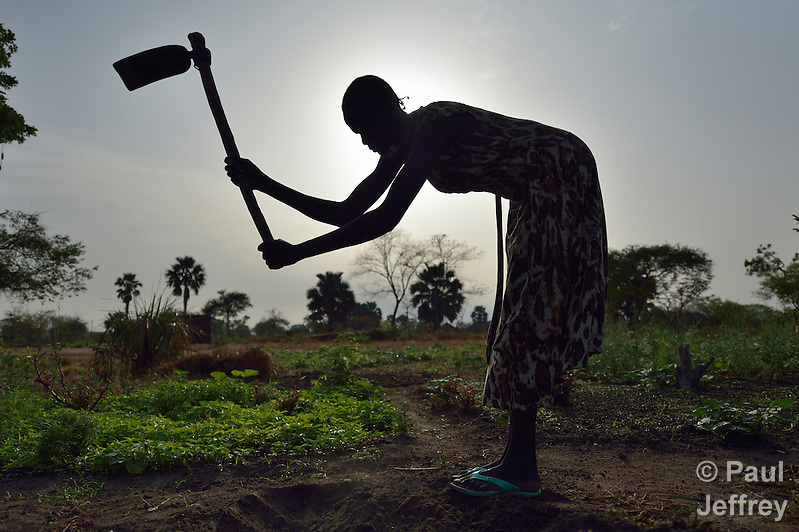 Growing food can be risky nowadays in South Sudan. 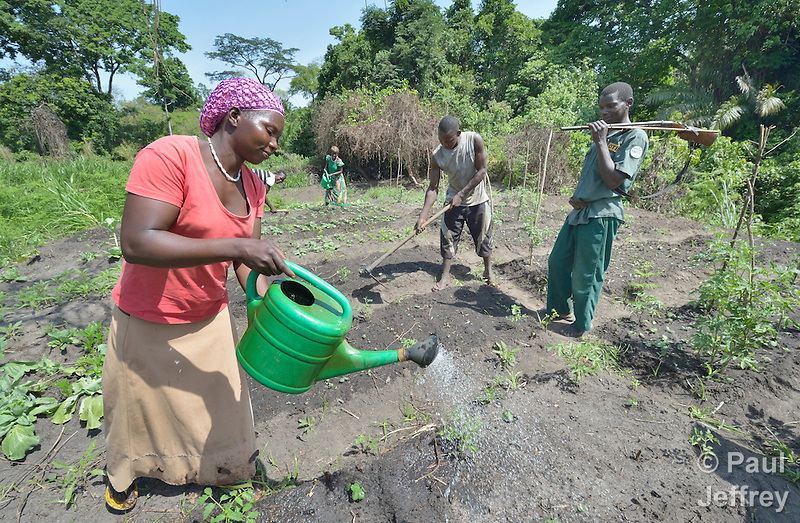 Along the country’s southern border with the Democratic Republic of the Congo, a church agency is helping people long displaced by the Lord’s Resistance Army to grow crops as they return home, even though they must remain armed to defend against sporadic attacks from the LRA. 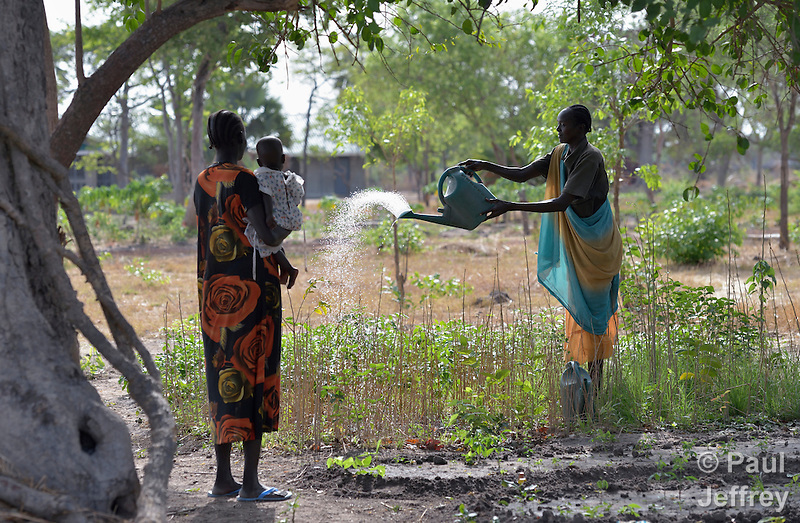 Churches are involved in whatever is necessary to sustain life in the midst of war, whether it’s shelter assistance in Abyei, a well for war-displaced families in Mundri, or a displaced girl getting her family’s sorghum ground at a church-sponsored mill run by widows in Agok. 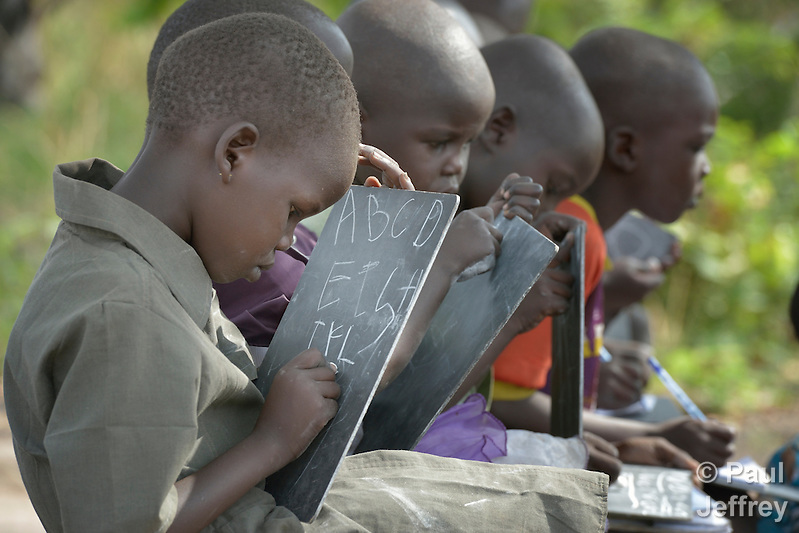 As the government has turned more and more of its resources to fighting those it perceives as its enemies, it has fewer resources to dedicate to education, leaving the church to do what it has done well in many places in Africa–educating the poor. The same is true for health care. In Wau, I returned once again to document the amazing work done by the dedicated folks at the Saint Joseph Comboni Hospital. 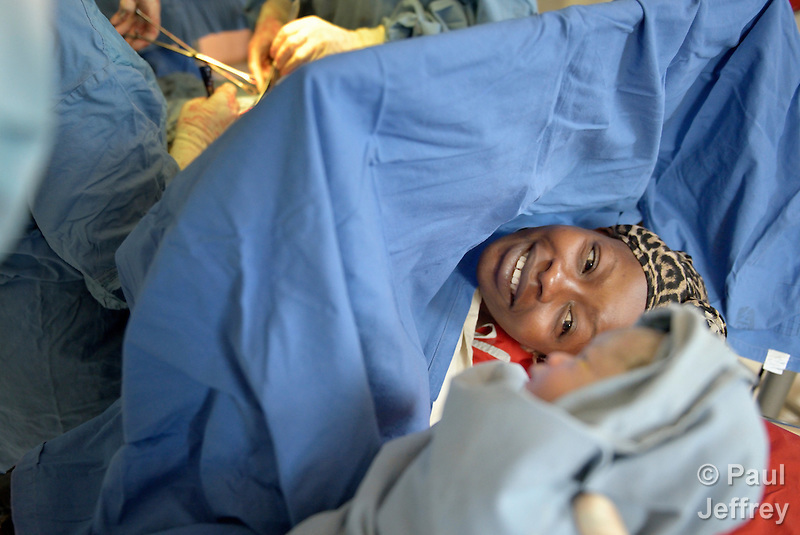 This visit included an opportunity to photograph a Caesarean section–and the moment in which Fatima Nakuyioko first sees her new baby. From the frustrating peace talks in Addis Ababa to working out the nuts and bolts of reconciliation on the ground in rural villages, the church is present, often encouraging people not to trust the important decisions to corrupt political leaders, but rather to assume the vocation of building peace as their own. 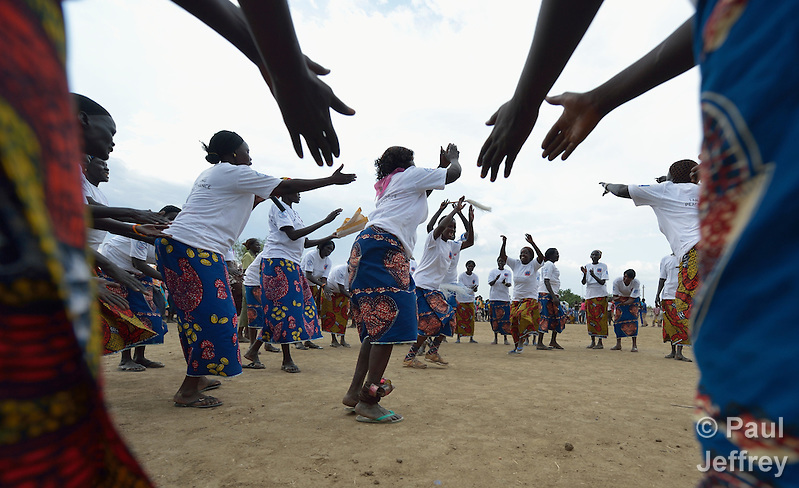 Such peacebuilding often has its own rhythm, as seen here in a women’s peace event in Abyei. My hosts for much of the time I was in South Sudan were the folks from Solidarity with South Sudan, an international network of faith communities responding together to the ongoing crisis in the country. Although they’re all Catholics, they warmly welcomed me despite the fact I often mumbled the words of the liturgy they all know so well. 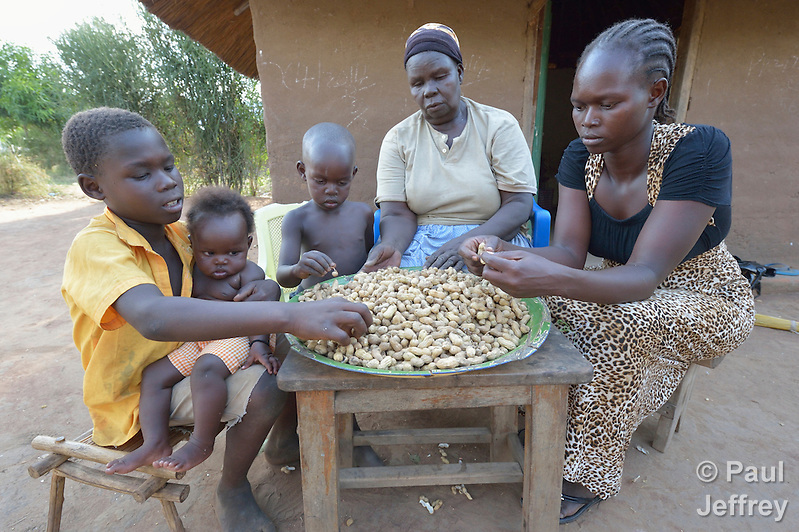 Their members working around the country–Mike Bassano is a good example–are deeply committed to empowering the South Sudanese to survive and thrive and, ultimately, to build themselves the new country about which they dreamed for so long. 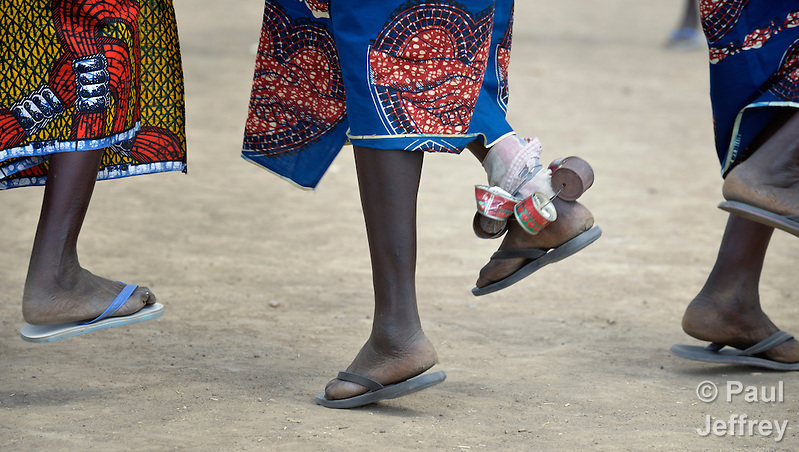 Their vocation is to walk beside the people of South Sudan, no matter how difficult the road or obscure the destination. 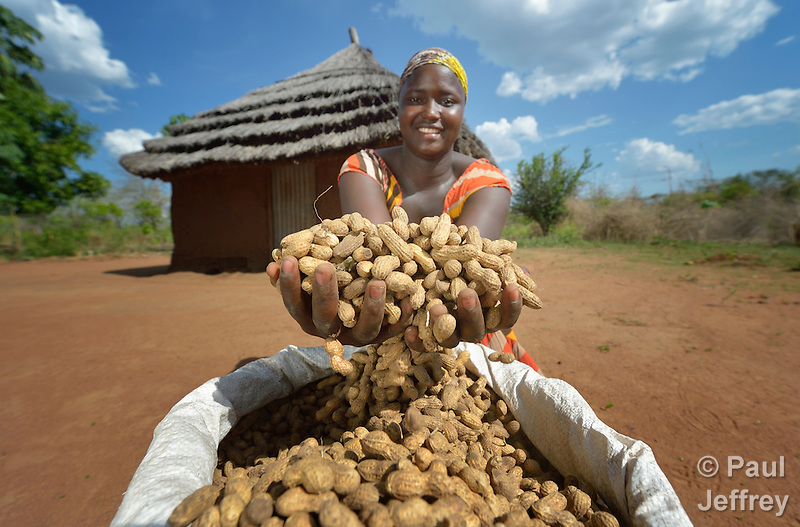 July 31, 2015 | Filed under Africa, Blog, Church, Disasters, Refugees, War. 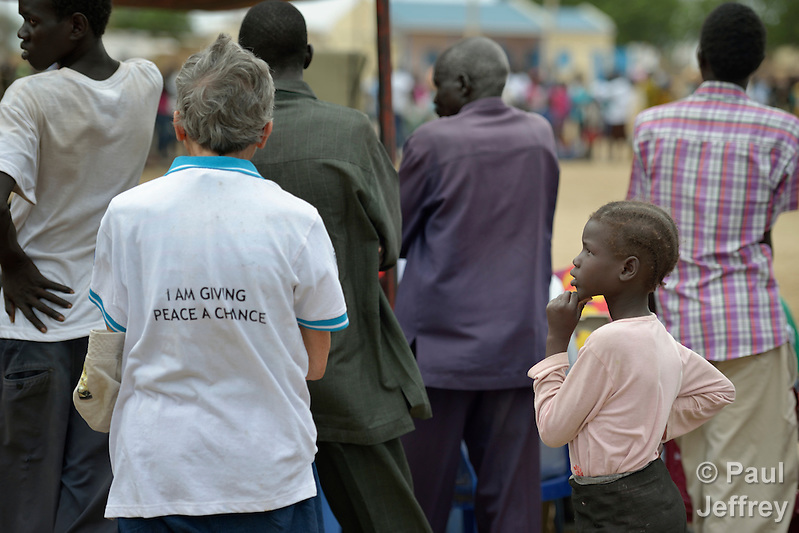 One Response to South Sudan – Is there hope?